It’s getting so a cruise passenger can’t even stroll the 1,115-foot-long ship in private without launching interactivity. The venue is the company’s first new ship since 1999, the 4,000-passenger Disney Dream. It began sailing from Port Canaveral, Fla., on Jan. 26. And aboard this vessel, technology rules, in clever and entertaining ways. For instance, in 22 places along the corridors of the Dream, framed images from classics such as Bambi and Fantasia are actually LCD screens. 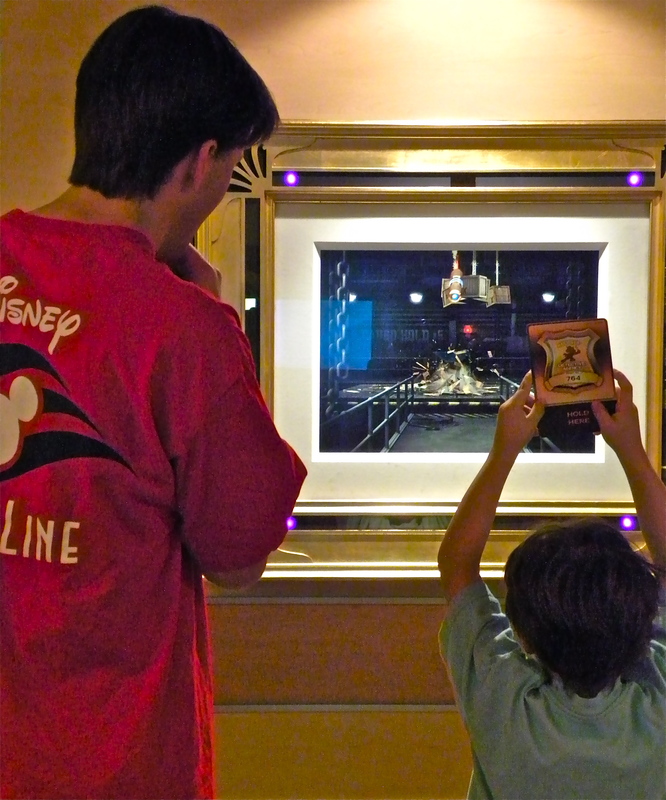 They change — thanks to motion detectors — from a static image to several seconds of the film when passengers approach. Soon, facial recognition software will insure that individual guests see a different loop the next time they approach the frame. A dad helps his son solve one of the mysteries that play on the Enchanted Art frames in public spaces aboard the Dream. Passengers can even play detective, solving different mysteries by passing a special card in front of some of those frames, which read a bar code on the card and then display a clue. Speaking of animation, a starring role aboard the ship goes to Crush, the surfer-dude sea turtle from Finding Nemo. A few years ago, the Imagineers introduced an interactive version of Crush to the theme parks: Youngsters face a huge LED screen, onto which the animated turtle swims. He asks specific kids their names, jokes with them, answers their questions. On the ship, Crush reprises this act on a 103-inch plasma screen in the Oceaneer’s Club, hangout for the 3- to 10-year-old set. But Crush is also the headliner in the Animator’s Palate, one of three restaurants passengers use on a planned rotation for dinners. When diners enter, the 696-seat Palate is decorated as a studio where Walt Disney and his colleagues might have worked in the 1930s. Giant pencils and paint brushes stand upright in the room, while wallboards hold notes and character sketches. But during the meal, the room changes, seemingly submerging into the waters occupied by Crush and his undersea pals. On more than 100 TV monitors of varying sizes, these creatures flit about, and Crush visits with diners in nine sections of the room. 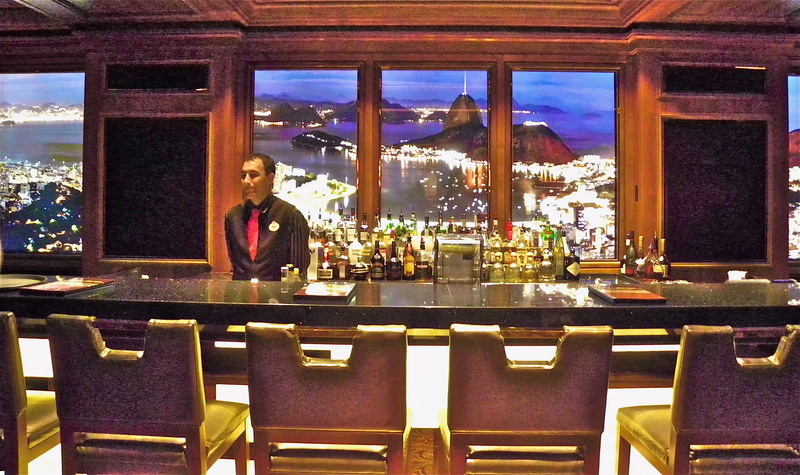 / Seven large “windows’’ of the Skyline bar each day show a different cityscape – New York, Rio or Paris, for instance – though the ship sails to none of these places. Light or shadows play out in real time during the day as the sun crosses above that city, and sharp-eyed viewers can see cars moving on the streets. The windows are actually LED screens. Those LED screens were a clever plan by cruise executives: “Ordinarily, inside cabins are those least-desired by passengers,’’ Karl Holz, cruise line president, told me onboard in mid-January. But when word spread over the Internet about the “virtual portholes,’’ the inside cabins quickly sold out. What’s likely to become the Dream’s icon is hard to miss: the 765-foot long, enclosed waterslide named the AquaDuck. 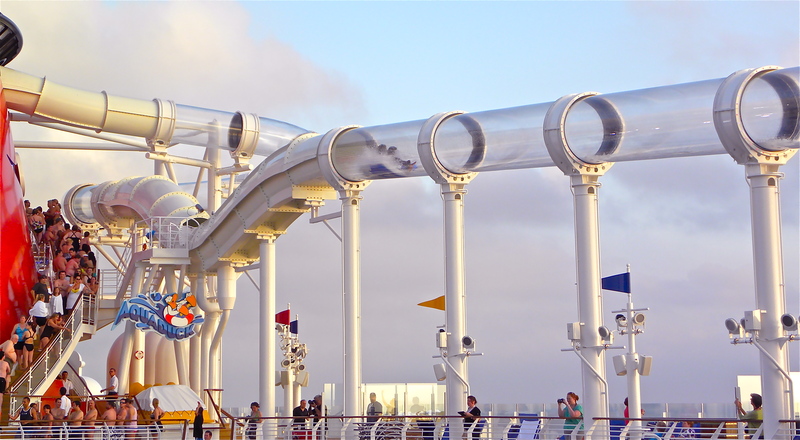 Mounted 150 feet above the waterline and passing down both sides of the ship, the water coaster is a transparent tube, 54 inches in diameter, through which pumps force more than 9,000 gallons of water. Passengers sit on two-person rubber rafts and are immediately thrust into a 360-degree loop that carries them over the side of the ship for about 12 feet, before returning them to the first long, straight part of the ride. They pass through the forward funnel, then again parallel the hull for another 335 feet, before ending about 46 feet below where they started. The general design of the Dream avoids the current boxy look of mega ships, with a pronounced prow and an added curve of metal sweeping down several decks of staterooms, near the stern. Interiors blend touches of Art Nouveau, Art Deco and of course, Disney whimsy. There’s no chance passengers will forget that the parent company grew from cartoons to beloved, full-length animated films. 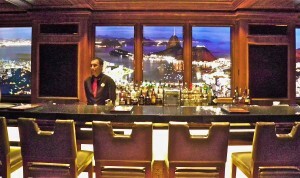 There’s plenty to amuse adults, too, such as four themed bars – a sports pub, a champagne bar, etc. — plus a disco, grouped in the area termed The District, and adults-only fine-dining restaurants, one Italian, one French. The Italian restaurant is the 118-seat Palo, already a fixture on the Disney Magic and Disney Wonder. 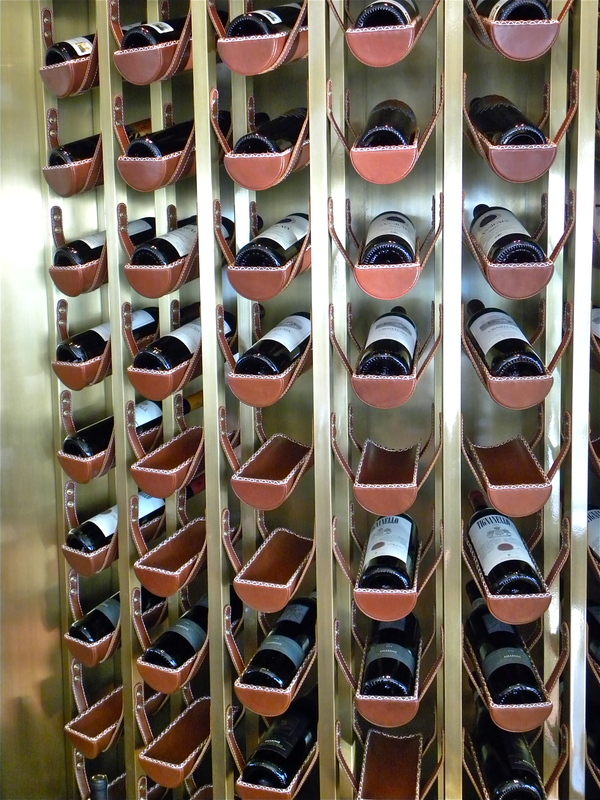 This venue alternates rich fabrics on its banquettes, displays its wines in custom-made leather holders, and its private room has a window on the kitchen. Dinner here is a $20 surcharge per person. 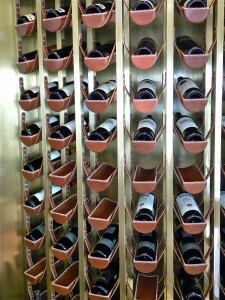 Custom-made leather wine bottles holders are a fixture in Palo. More upscale is the French room, Remy, which seats just 65 for once-a-night servings designed to last three hours. 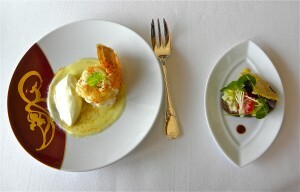 It boasts a pair of five-course dinners on a menu designed jointly by a French chef with two Michelin stars and by the American chef responsible for consistently earning five AAA diamonds and five Mobil stars for the Victoria and Albert restaurant, in the Disney parks’ Grand Floridian hotel. Remy offers appetizers such as langostino and smoked bison. Though Remy takes its name and even some deft design elements from a rat who is the leading character in the animated film Ratatouille, there’s no kidding around about the price: $75 per person for just the food, $99 if you also want the wine pairings. Still, the purposely limited capacity of the gourmet restaurants means relatively few members of the average shipload of passengers is going to leave the Dream happily recalling a meal there. Instead, it is the clever gadgetry, big and small, that they’ll be telling friends about. For more information or to make reservations, contact a travel agent or go to http://disneycruise.disney.go.com.